wild boar | Can Men Cook? Phil made a public promise that there would be an occasional guest blog from me – so here it is – the ramblings of a virgin blogger! 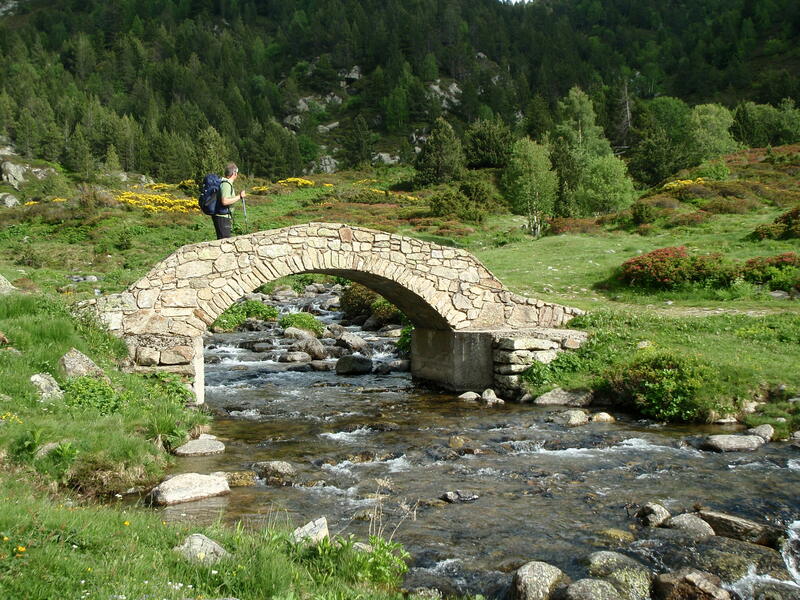 A few weeks ago I had a significant birthday – one of those ones that ends in zero, and having got over the disappointment that I have to wait another 3 years to get my bus pass, I decided that I wanted to spend my birthday walking and camping in the sunshine in the Pyrenees. If you ever get the chance to go to Andorra – jump at it, it’s beautiful, clean and peaceful and while very few people speak English, they seemed content to let me rabbit on in sentences that mixed my vocabulary from my schoolboy French, German, Spanish and English. 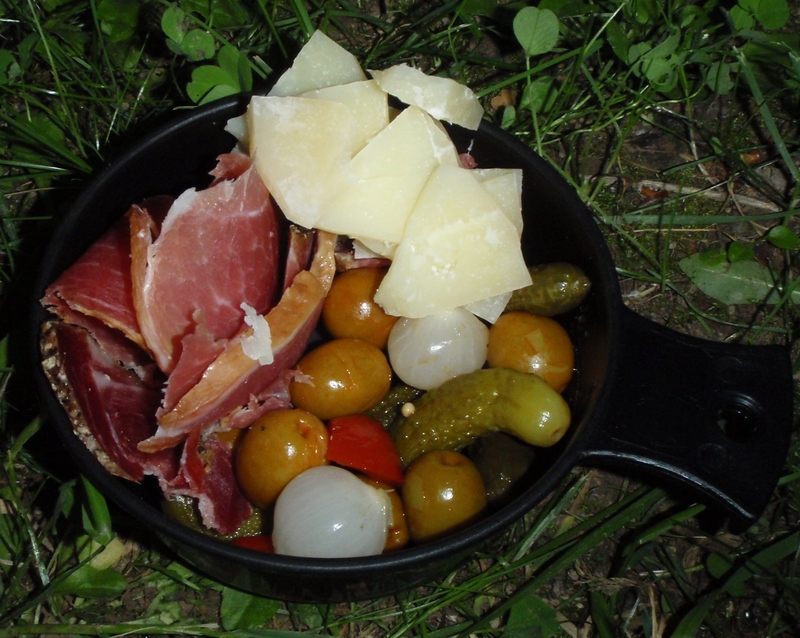 So with the help of arm waving and speaking slowly and loudly I assembled the ingredients for my birthday dinner – a superb piece of wild boar Serrano ham, a sheep’s milk hard cheese, some olives, and a few pickles for a starter, and a beautiful piece of steak, some new potatoes and selection of fresh vegetables. Yes you can imagine the gestures and noises to establish that the ham was from a wild boar, and the cheese from a sheep. On B day minus 1, I found the perfect spot for the special dinner – about 30 minute’s walk from the head of the valley road, fantastic views, a small bridge over a babbling stream of snow melt water, space for a wild camp site and a barbecue base for an open fire – just the party I had imagined. B day turned into the biggest low pressure system stuck over Andorra, with thunder, lightning and torrential rain – the vision was no longer realistic, the location at least would have to be changed – more arm waving and jumbled languages established that the sun was shining further south and east in the foothills of the Spanish Pyrenees. So to a camp site run by Frau Grumpy – more of her special brand of customer service in another guest blog. Well the location had changed but I still had the wild mint and thyme picked the day before, and I had my trusty Primus Eta Express – the best lightweight camp stove I’ve ever owned – boils enough water for a pint mug of tea in less than 2 minutes. But could I still recreate the vision, with a single burner stove and a one litre pot? Or should I take the easy but disappointing option of a one pot stew, or the even easier or more disappointing option from Frau Grumpy’ s camp site “restaurant” of sausage und salat. How did a miserable German end up running a camp site in a beautiful part of Spain? 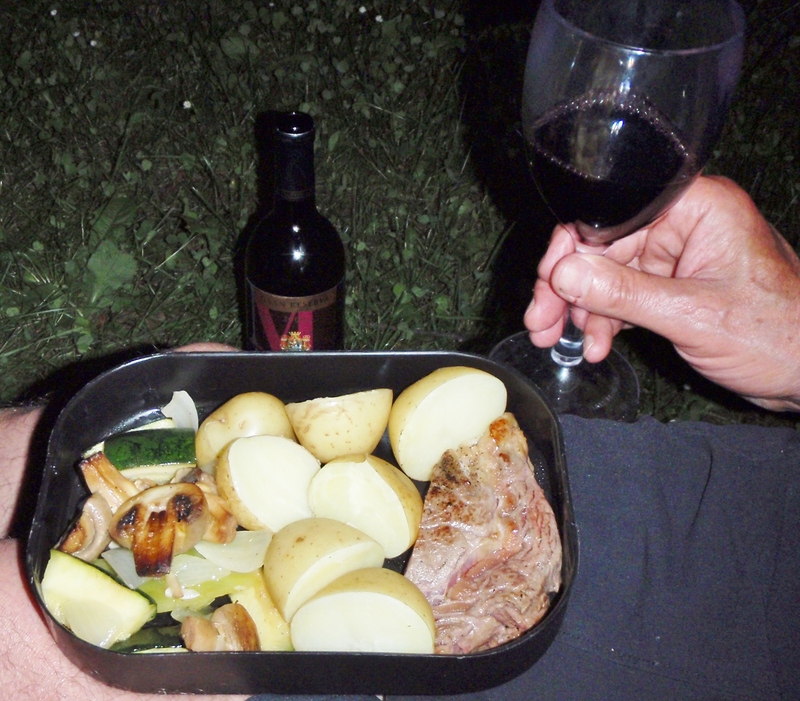 I can still be a petulant 60 year old child – I had dreamed of steak, minted new potatoes, and roasted vegetables – and Frau Grumpy helped reinforce that desire. Could the Eta Express deliver – well why would you ever doubt it, just a bit of creative thought required. First almost cook the potatoes with the fresh mountain mint, drain, plate up wrap in a T towel and stuff in the sleeping bag to finish cooking and keep warm. Then with an excellent Spanish olive oil blast the chopped onions, courgette, peppers and mushrooms with some fresh mountain thyme – crunchy and bronzed, and while they keep warm in the cooking pot use the lid to quickly fry off the perfect rare steak. Now I was pretty pleased, but of course the 2004 Gran Reserva Rioja may have had something to do with that.